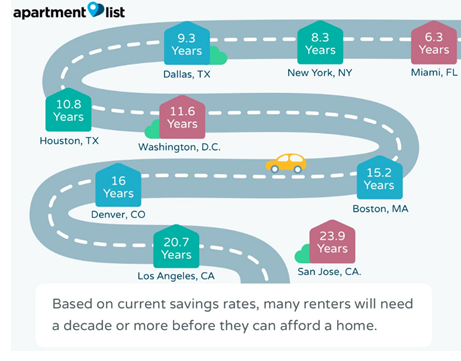 ​​​ HOUSTON AREA – The report by rental website Apartment List finds that 83 percent of Houston millennials surveyed—born between 1982 and 2004—plan to purchase a home at some point. But 71 percent are waiting because they say they can’t afford to buy a house or condo right now. Chris Salviati, data analyst at Apartment List, said nationwide, two-thirds of survey participants expect to wait three years or more. “When we look at the trends over the past couple of years of our study, it seems that those plans are actually being pushed further and further into the future,” he said. Assuming a 20 percent down payment and considering how much they have saved for it, for many Houston millennials buying a house won’t be possible for more than a decade, according to the survey. But Cindy Hamann, chairman of the Houston Association of Realtors, disagrees. “The only reason you would want to save 20 percent is if you wanted to be in control of your escrow, which is your taxes and your insurance,” she said. ​Check out​ DFW and Houston Housing Market Research.